This short but very steep hike begins at the end of Forest Road 5920. The trail begins an extremely steep climb immediately. However, in a short distance it begins to become more reasonable as it switchbacks up the very steep terrain toward Lake Christine. In about a mile you break over a saddle and come upon Lake Christine. This a beautiful little lake nestled between opposing peaks. The trail goes around the south side of the lake in what can be a very marshy area. On the east side of the lake, the trail heads northeast on its way to Goat Lake. About a half mile later, you will come to a sign with the word TRAIL on it. The trail to Goat Lake bears right. You need to bear left and follow a user trail up very steep terrain. 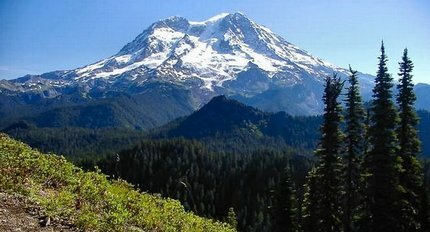 Soon the trail breaks out into the open and as you reach the summit of Mount Beljica, you are greeted with outstanding vistas of Mt Rainier, the Goat Rocks, Mt Adams, Mt Hood, and Mt St Helens. In season there are lots of beautiful floral displays to add to the enjoyment of this short but challenging hike. From Ashford travel east on highway 706 for about 3 miles. Turn left (north) onto Forest Road 59. 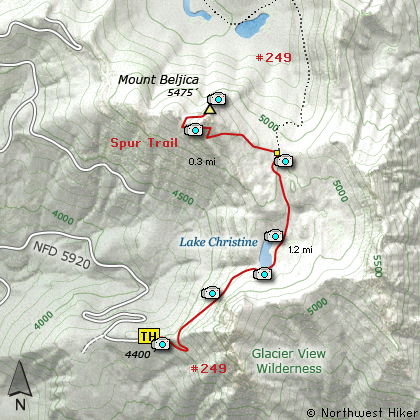 At 4.1 miles you will pass Forest Road 5920 which goes to the trailhead for Lake Christine. Bear right on FS 5920 for another mile to the trailhead for this hike.